Rubinoff, P, C. Rubin, D. Robadue, J. Riccitelli, C. Collins, D. Robadue, C. Damon, K. Ruddock, P. August, C. Chaffee, E. Horton-Hall, and A. Ryan. The pilot project developed in 2010-2012 and presented in this report is a contribution towards fostering climate change adaptation at the community level. 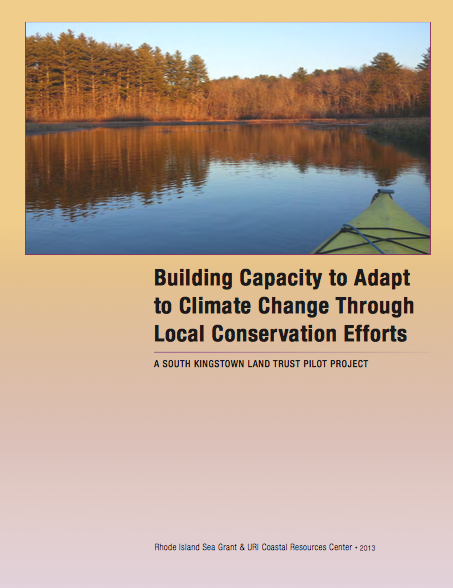 The report’s emphasis is on the role and perspective of local landtrusts, acknowledging recent guidance on the need to incorporate a climate lens into local conservation planning (such as the Land Trust Alliance’s Climate Change Toolkit). Both the experience of engaging in this process and the resulting analyses, maps and recommendations offer lessons and materials that we believe are relevant for other land trusts and conservation groups as well as for municipal conservation and planning commissions. Identify ways to implement adaptation strategies through conservation, management and investment.